Club cells are found in the ciliated simple epithelium. These cells may secrete glycosaminoglycans to protect the bronchiole lining. Bronchiolar cells gradually increase in number as the number of goblet cells decrease. Glycosaminoglycans (GAGs) or mucopolysaccharides are long unbranched polysaccharides consisting of a repeating disaccharide unit. The repeating unit consists of an amino sugar along with a uronic sugar or galactose. Glycosaminoglycans are highly polar and attract water. They are therefore useful to the body as a lubricant or as a shock absorber. Goblet cells are simple columnar epithelial cells that secrete gel-forming mucins, like mucin MUC5AC. The goblet cells mainly use the merocrine method of secretion, secreting vesicles into a duct, but may use apocrine methods, budding off their secretions, when under stress. The term goblet refers to the cell's goblet-like shape. The apical portion is shaped like a cup, as it is distended by abundant mucus laden granules; its basal portion lacks these granules and is shaped like a stem. Uteroglobin, also known as secretoglobin family 1A member 1 (SCGB1A1), is a protein that in humans is encoded by the SCGB1A1 gene. The respiratory bronchioles represent the transition from the conducting portion to the respiratory portion of the respiratory system. 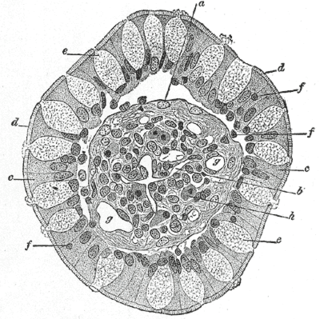 The narrow channels are usually less than 2 mm in diameter and they are lined by a simple cuboidal epithelium, consisting of ciliated cells and non-ciliated club cells, which are unique to bronchioles. In addition to being structurally diverse, club cells are also functionally variable. One major function they carry out is the synthesis and secretion of the material lining the bronchiolar lumen. This material includes glycosaminoglycans, proteins such as lysozymes, and conjugation of the secretory portion of IgA antibodies. These play an important defensive role, and they also contribute to the degradation of the mucus produced by the upper airways. The heterogeneous nature of the dense granules within the club cell's cytoplasm suggests that they may not all have a secretory function. 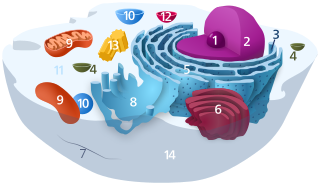 Some of them may contain lysosomal enzymes, which carry out a digestive role, either in defense: Club cells engulf airborne toxins and break them down via their cytochrome P-450 enzymes (particularly CYP4B1, which is only present in the club cells) present in their smooth endoplasmic reticulum; or in the recycling of secretory products. Club cells are mitotically active. They divide and differentiate to form both ciliated and non-ciliated epithelial cells. Lysozyme, also known as muramidase or N-acetylmuramide glycanhydrolase is an antimicrobial enzyme produced by animals that forms part of the innate immune system. Lysozyme is a glycoside hydrolase that catalyzes the hydrolysis of 1,4-beta-linkages between N-acetylmuramic acid and N-acetyl-D-glucosamine residues in peptidoglycan, which is the major component of gram-positive bacterial cell wall. This hydrolysis in turn compromises the integrity of bacterial cell walls causing lysis of the bacteria. Tryptase is the most abundant secretory granule-derived serine proteinase contained in mast cells and has been used as a marker for mast cell activation. Club cells contain tryptase, which is believed to be responsible for cleaving the hemagglutinin surface protein of influenza A virus, thereby activating it and causing the symptoms of flu. Hemagglutinin or haemagglutinin[p] refers to glycoproteins which cause red blood cells (RBCs) to agglutinate. This process is called hemagglutination or haemagglutination. Max Clara was a German anatomist. He was appointed as Chair of Anatomy at Leipzig University in 1935. Clara is known for having close ties with the Nazi Party, controversially basing much of his work on his studies of the bodies of executed prisoners, without the consent of the prisoners' families. His main work, "Das Nervensystem des Menschen" was written in 1942 in Leipzig during the Third Reich's dictatorship. A pulmonary alveolus is a hollow cavity found in the lung parenchyma, and is the basic unit of ventilation. Lung alveoli are the ends of the respiratory tree, branching from either alveolar sacs or alveolar ducts, which like alveoli are both sites of gas exchange with the blood as well. Alveoli are particular to mammalian lungs. Different structures are involved in gas exchange in other vertebrates. The alveolar membrane is the gas exchange surface. Carbon dioxide rich blood is pumped from the rest of the body into the capillaries that surround the alveoli where, through diffusion, carbon dioxide is released and oxygen is absorbed. The bronchioles or bronchioli are the passageways by which air passes through the nose or mouth to the alveoli of the lungs, in which branches no longer contain cartilage or glands in their submucosa. 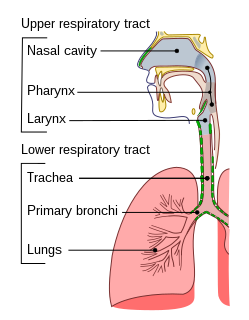 They are branches of the bronchi, and are part of the conducting zone of the respiratory system. The bronchioles divide further into smaller terminal bronchioles which are still in the conducting zone and these then divide into the smaller respiratory bronchioles which mark the beginning of the respiratory region. Immunoglobulin A is an antibody that plays a crucial role in the immune function of mucous membranes. The amount of IgA produced in association with mucosal membranes is greater than all other types of antibody combined. In absolute terms, between three and five grams are secreted into the intestinal lumen each day. This represents up to 15% of total immunoglobulins produced throughout the body. Amelogenesis is the formation of enamel on teeth and begins when the crown is forming during the advanced bell stage of tooth development after dentinogenesis, forms a first layer of dentine. Although dentin must be present for enamel to be formed, ameloblasts must also be for dentinogenesis to continue. A message is sent from the newly differentiated odontoblasts to the inner enamel epithelium (IEE), causing the epithelial cells to further differentiate into active secretory ameloblasts. Dentinogenesis is in turn dependent on signals from the differentiating IEE in order for the process to continue. This prerequisite is an example of the biological concept known as reciprocal induction, in this instance between mesenchymal and epithelial cells. Respiratory epithelium is a type of ciliated columnar epithelium found lining most of the respiratory tract, where it serves to moisten and protect the airways. It is not present in the larynx and pharynx. It also functions as a barrier to potential pathogens and foreign particles, preventing infection and tissue injury by the action of mucociliary clearance. Simple cuboidal epithelium is a type of epithelium that consists of a single layer of cuboidal (cube-like) cells. These cuboidal cells have large, spherical and central nuclei. Idiopathic interstitial pneumonia (IIP), or noninfectious pneumonia are a class of diffuse lung diseases. These diseases typically affect the pulmonary interstitium, although some also have a component affecting the airways. There are seven recognized distinct subtypes of IIP. Diffuse panbronchiolitis (DPB) is an inflammatory lung disease of unknown cause. It is a severe, progressive form of bronchiolitis, an inflammatory condition of the bronchioles. The term diffuse signifies that lesions appear throughout both lungs, while panbronchiolitis refers to inflammation found in all layers of the respiratory bronchioles. DPB causes severe inflammation and nodule-like lesions of terminal bronchioles, chronic sinusitis, and intense coughing with large amounts of sputum production. A peg cell is a non-ciliated epithelial cell within the uterine tube. These cells are also known as an intercalated or intercalary cell. These cells represent one of 3 epithelial cell types found within the normal fallopian tube epithelium and are the most infrequent. The other two cell types include ciliated columnar and non-ciliated secretory cells. The ratio of these remaining cells is dictated by an individual's hormone status. Peg cells are thought to represent a quiescent maturational stage of the background non-ciliated secretory cells. Unlike secretory cells, these cells lack apical granules reflecting their non-functional nature. ↑ Peter J. Papadakos; Burkhard Lachmann (29 August 2007). Mechanical Ventilation: Clinical Applications and Pathophysiology. Elsevier Health Sciences. pp. 74–. ISBN 978-0-7216-0186-1 . Retrieved 27 May 2011. ↑ Atkinson JJ, Adair-Kirk TL, Kelley DG, Demello D, Senior RM (2008). "Clara cell adhesion and migration to extracellular matrix". Respir. Res. 9 (1): 1. doi:10.1186/1465-9921-9-1. PMC 2249579 . PMID 18179694. ↑ Taubenberger JK (August 1998). "Influenza virus hemagglutinin cleavage into HA1, HA2: No laughing matter". Proc. Natl. Acad. Sci. U.S.A. 95 (17): 9713–5. doi:10.1073/pnas.95.17.9713. PMC 33880 . PMID 9707539. ↑ Fernández-Valdivia R, Zhang Y, Pai S, Metzker ML, Schumacher A (January 2006). "l7Rn6 Encodes a Novel Protein Required for Clara Cell Function in Mouse Lung Development". Genetics. 172 (1): 389–99. doi:10.1534/genetics.105.048736. PMC 1456166 . PMID 16157679. ↑ Provost EB, Chaumont A, Kicinski M, Cox B, Fierens F, Bernard A, Nawrot TS. “Serum levels of club cell secretory protein (Clara) and short- and long-term exposure to particulate air pollution in adolescents” Environ Int. 2014 Apr 4;68C:66-70. doi: 10.1016/j.envint.2014.03.011. ↑ Winkelmann, Andreas; Noack, Thorsten (2010). "The Clara cell - a "Third Reich eponym"?". European Respiratory Journal. 36 (4): 722–7. doi:10.1183/09031936.00146609. PMID 20223917. ↑ Irwin, RS; Augustyn N; French CT; Rice J; Tedeschi V; Welch SJ (2013). "Spread the word about the journal in 2013: from citation manipulation to invalidation of patient-reported outcomes measures to renaming the Clara cell to new journal features". Chest. 143: 1–5. doi:10.1378/chest.12-2762. PMID 23276834. ↑ Akram, KM; Lomas NJ; Spiteri MA; Forsyth NR (2013). "Club cells inhibit alveolar epithelial wound repair via TRAIL-dependent apoptosis". Eur Respir J. 41: 683–694. doi:10.1183/09031936.00213411. PMID 22790912.